Sustained economic growth has enabled China to become the second largest economy in the world. Urbanization and westernization in China has led to a dramatic shift from the traditional rice and vegetable diets toward meats, sweets, and processed food. In the past decade, the per capita sugar consumption has risen by 48%,  and it is expected that it will be double the 2000-2007 sugar consumption growth rate over the next few decades. A national representative study found that two-thirds of the participating adolescents ate sweets every day and the difference in this practice between urban and rural respondents was insignificant. These changes highlight the challenges facing the country in controlling chronic diseases, including dental caries. Fortunately, there are reports showing that oral health awareness, dental knowledge, and attitudes toward good oral health behavior have improved among children and parents in parallel with the dietary change toward western food. Furthermore, China's medical care system is in a period of transition. For example, a number of medical insurance schemes were introduced during the last decade, resulting in a reported increase in medical insurance coverage from 15% in 2003 to 85% of the population in 2008. In contrast to previous years, basic dental care, such as restoration and extraction, is now covered through insurance schemes, although the reimbursement is low. In a country where each passing day sees considerable ongoing changes, the oral health situation of its people should be monitored regularly to provide appropriate information for public healthcare administration and for enabling decision-makers to act accordingly. One important example of such information is the presence or absence of an upward trend in the prevalence and severity of dental caries among children. The three national oral health surveys carried out among the same age groups, but in different locations, in 1983, 1995, and 2005, provided useful information on the caries status of 5-year-olds. However, these reports are insufficient for monitoring caries prevalence over time, as the diagnostic criteria applied in 2005 were different from those of the two surveys conducted earlier. ,, Other smaller cross-sectional oral health surveys have been conducted in different provinces and local communities of China. ,, However, a series of cross-sectional studies on the prevalence of dental caries in one and the same location have not been carried out in the country. Such a series would provide more insight into the presence of secular trends like cohort effects. The aim of the present study was to test the hypothesis that dental caries prevalence and caries experience in primary dentition of 7-year-olds was higher in 2011 than in 2007 and to compare the presence of plaque on permanent teeth in two child cohorts over 4 years. The study design used in the present investigation is called a "time-lag" design, comprising the two development parameters, age (7 years) and period/year of observation (2007 and 2011). This design concerns the study of a specific age group during several generations. The two oral health surveys were carried out among Grade 2 children from the same five primary schools in Wuhan. The schools are situated within a 5 km radius from the Dental School of Wuhan University, and were chosen for the convenience of transporting equipment and personnel to conduct a dental sealant trial. The 2007 survey formed the basis from which children with high risk of caries were selected for participation in this sealant trial. The reader is referred to Chen et al. for further information regarding the sealant trial. A power calculation for including the estimated number of children in the sealant trial resulted in a required sample size of 1000 Grade 2 children for the epidemiological survey. Wuhan, the capital city of Hubei Province, is recognized as the political, economic, financial, cultural, educational, and transportation center of Central China and had a population of about 10 million people in 2011. The Growth Domestic Product of the city increased from US$ 0.63 billion in 1978 to US$ 50 billion in 2007  and US$ 107 billion in 2011. Permission to conduct the surveys and the sealant trial was granted by the school authorities, and informed consent was obtained from the parents or legal representatives of all participating children. The study was approved by the ethical committee of Wuhan University, with Reference Number 200704 and Number 201152, and was registered at the Dutch Trial Center, with Reference Number 1411. All Grade 2 students present on a day in December 2007 and December 2011 were examined orally at the school premises by two seated and calibrated examiners using mouth mirrors and explorers. Two trained chair-side assistants did the recording. Each child lay on a table. 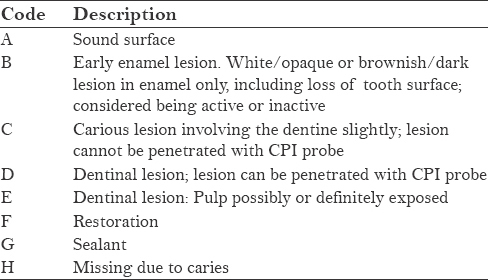 The oral cavity was illuminated by a removable site light, providing adequate light for assessing plaque accumulation on the six (permanent) index teeth, according to the Greene and Vermillion Index,  and the dentitions, according to the Atraumatic Restorative Treatment (ART) caries criteria [Table 1]. The examiners in 2011 were different from those in 2007. No X-rays were taken. Plaque and/or debris were removed from the tooth surfaces with an explorer, if necessary, to facilitate proper caries lesion detection. The Community Periodontal Index (CPI) probe was used for diagnosing small dentine caries lesions as part of the criteria used [Table 1]. The data on the 7-year-olds were analyzed by a statistician using SAS version 9.2. The d 2 -component consisted of caries codes B-E, whereas the d 3 -component consisted of caries codes C-E. Differences between the dependent variables, those related to the different caries indices and caries prevalence, and the independent variables (gender and year of observation) were tested using analysis of variance (ANOVA) and logistic regression, respectively. The Chi-square test was used for testing differences in gender distribution and plaque accumulation for the category 0-1 versus 2-3 and that of 0-2 versus 3 by the year of observation. A statistically significant difference was set at α = 0.05. The 2007 sample consisted of 817 (446 boys and 371 girls) children and the 2011 sample of 1010 (577 boys and 433 girls) children. No statistically significant difference was observed between the proportion of boys and girls in 2007 and in 2011 (P = 0.28). The prevalence of dental caries (d 3 mft) was 68.2% in 2007 and 67.7% in 2011 (P = 0.84), while the prevalence of enamel and dentine caries lesions (d 2 mft) was 78.5% and 71.4% in 2007 and 2011, respectively (P = 0.0006). No gender effect was observed on the mean d 2 mft, d 3 mft and d 2 mfs, d 3 mfs scores, and those of the individual indices between 2007 and 2011 (P ≥ 0.05). [Table 2] presents the mean and standard deviation scores of the d 2 mft, d 3 mft and d 2 mfs, d 3 mfs indices, and the prevalence of dental caries in 2007 and 2011, corrected for gender. At tooth level, an effect of year of observation was observed for the mean d 2 t (carious lesions in both enamel and dentine) (P < 0.001), the mean ft (P = 0.002), and the mean d 2 mft (P < 0.004) scores. Lower mean scores were found for these variables in 2011, except for the ft-component, whose mean score was higher in 2011 than in 2007. At tooth surface level, an effect of year of observation was observed for all the mean d 2 mfs and d 3 mfs and their individual component scores, except for the ms-component (P = 0.24). Higher mean scores were found for these caries index variables in 2011 than in 2007. The d 2 -component of the dmft index was 81% and 73% in 2007 and 2011, respectively, while the d 3 -component was 73% in 2007 and 69% in 2011. The f-component of the dmft index was 22% in 2007 and 26% in 2011. [Table 3] shows the prevalence of plaque accumulation scores according to the year of observation. A statistically significant difference was observed between the distribution of plaque accumulation in children of 2007 and 2011 sample (P < 0.0001). Corrected for the year of observation, there was no gender effect observed for the category 0-1 versus 2-3 (P = 0.29) and for that of 0-2 versus 3 (P = 0.88). The proportion of children with code 3 was higher in 2011 (22.1%) than in age mates in 2007 (5.9%), and the prevalence of those with code 1 was lower in 2011 (17.2%) than for their peers in 2007 (30.0%). Considering that the economy in China has increased steadily over the past decades, leading to an increase in the purchasing power of millions of Chinese people, that the per capita sugar consumption has increased tremendously, and that the traditional diet is undergoing changes toward availability of more processed foods, the situation warrants monitoring of the prevalence and severity of dental caries, particularly in young children. It is, therefore, not unlikely to think that an upward trend (cohort effects) in caries prevalence might be present in the society of China. Estimation of cohort effects using the Age, Period, Cohort (APC) analysis in a mixed-longitudinal study design in primary dentitions is difficult to perform because of the very short life of primary teeth, unless one starts the monitoring process at a very early age and considers canines and molars only. The second best option for monitoring cohort effects in caries prevalence in children of school-going age, therefore, is through the use of a time-lag study design, as was performed in the present study. A disadvantage of the time-lag study design for detecting cohort effects is the confounding with period effects as age is not varied. Attempts to control period effects in the present study involved testing the level of reproducibility of examiners in scoring carious lesions and related conditions through the inter-examiner consistency tests at the tooth surface level. According to Landis and Koch,  the outcome of these tests showed a substantial level of agreement in both observation years (periods). Despite the fact that the quality of the data obtained in both periods seems to be sufficiently high, systematic differences between the examiners in 2007 and, subsequently, in 2011 cannot be excluded. However, such differences cannot be calculated. The fact that the same senior epidemiologist trained the examiners in 2007 and 2011 for each survey adds support to the assumption that the data in the present study can be considered reliable. As the cohorts of children had been selected in a convenient way, for participation in a sealant trial, the external validity of the present study is very low. The prevalence and experience of dental caries (cavitated dentine lesions) in primary dentitions in these children was not different in any of the years of observation, while the prevalence and experience of dental caries, including enamel and dentine lesions, was lower in 2011 than in 2007. The hypothesis was not accepted. Nevertheless, between 2007 and 2011, a few remarkable changes in the carious lesion pattern in this type of dentition were noticed. In 2011, significantly more primary teeth with enamel carious lesions and more restored primary teeth were observed than 4 years earlier. At the tooth surface level, significantly more or extended enamel caries lesions, dentine cavities, and restorations per primary tooth were observed in the dentitions of the 7-year-olds examined in 2011 than in 2007. Whether these findings are signs that the dental caries situation in the primary dentitions of 7-year-olds had worsened at the tooth surface level between those two calendar years cannot be concluded from the present study. However, these findings support the monitoring of the prevalence and severity of dental caries in primary dentitions in child populations in this area of Wuhan, and elsewhere in China, in the years to come, using a mixed-longitudinal study design starting, for example, at age 4. The finding that the proportion of 7-year-olds with plaque code 3 on permanent teeth was significantly higher in 2011 than in 2007 should, therefore, be taken seriously. It might be a reason for explaining the higher or extended enamel carious lesions found in the tooth surfaces of primary teeth between the two observation years. Proportionally, more cavities in primary teeth were restored in 2011 than in 2007. Exactly what factors may have contributed to this finding is unknown. However, among them might be the introduction around 2007 of the insurance system including a dental scheme,  increased dental awareness of the parents,  and the presence of a higher number of dental graduates and dental practices in the area in later years. The mean d 3 mft scores of 2.8 (2007) and 3.1 (2011) of the 7-year-olds in the present study appear to be somewhat lower than the mean d 3 mft score (4.1) for 6-7-year-olds of the same district of Wuhan City in 2000. No reasons could be found explaining the different scores reported for the severity of dental caries in primary dentitions of children in this district, other than the use of different caries assessment criteria and different examiners. In conclusion, the prevalence of dental caries (cavitated dentine lesions) and its severity in primary dentitions was as high in 2007 as it was in 2011. The d-component was equally high in both years of observation, while the f-component was proportionally higher in 2011 than in 2007. Mean caries experience scores at the surface level were higher in 2011 than in 2007. Overall, there were no obvious signs that dental caries prevalence was on the increase in primary dentitions of this child population between 2007 and 2011. Monitoring caries prevalence is essential and should start at an earlier age than that covered by this study. Health and educational authorities should collaborate in setting up programs aimed at ensuring good oral health for school children. We thank the participating children and school authorities for their enthusiastic collaboration. We are very grateful to Chen Xi, Liu LiHua, Zhang Weiwei, and recorders for performing the examinations. We appreciate the contributions by Prof. T. Pilot, who critically read the manuscript. The study was financed by grants from the Ministry of Science and Technology, China (2007BA128B00), the Netherlands Academy of Science (08CDP011), and the Radboud University Nijmegen (R0000463), the Netherlands. Liu JG, Raven PH. China′s environmental challenges and implications for the world. Crit Rev Env Sci Tec 2010;40:823-51. China Signpost. [WWWdocument]. Available from: http://www.chinasignpost.com/2011/05/internal-challenge-china%E2%80%99s-diabetes-epidemic-highlights-how-rising-healthcare-costs-could-constrain-economic-growth-and-military-spending/. [Last accessed on 2014 Sep 18]. Commonwealth Bank of Australia (CBA). Global Markets Research: Commodities: Agri Updates. 2012. p. 1-7. Zhu L, Petersen PE, Wang HY, Bian JY, Zhang BX. Oral health knowledge, attitudes and behaviour of children and adolescents in China. Int Dent J 2003;53:289-98. Dai J, Hao Y, Li G, Hu D, Zhao Y. ′Love Teeth Day′ campaign in China and its impact on oral public health- the twentieth anniversary. Br Dent J 2010;209:523-6. Xinhua News Agency. China unveils health-care reform guidelines. [WWWdocument]. Available from: http://www.china.org.cn/government/central_government/2009-04/06/content_17559519.htm. [Last accessed on 2014 Sep 18]. Saekel R. China′s oral care system in transition: Lesson to be learned from Germany. Int J Oral Sci 2010;2:158-76. Ministry of Public Health. National Epidemiological survey on dental caries and periodontal disease in schoolchildren. Beijing: People′s Health Publishing House; 1987. The National Committee for Oral Health. Second national survey of oral health in China. Beijing: People′s Health Publishing House; 1999. Hu DY, Hong X, Li X. Oral health in China - Trends and challenges. Int J Oral Sci 2011;3:7-12. Schwarz E, Zhang HG, Wang ZJ, Lin HC, Lo EC, Corbet EF, et al. An oral health survey in Southern China, 1997: Background and methodology. J Dent Res 2001;80:1453-8. Zhang Q, van Palenstein Helderman WH. Caries experience variables as indicators in caries risk assessment in 6-7-year-old Chinese children. J Dent 2006;34:676-81. Du M, Luo Y, Zeng X, Alkhatib N, Bedi R. Caries in preschool children and its risk factors in 2 provinces in China. Quintessence Int 2007;38:143-51. Chen X, Du MQ, Fan M, Mulder J, Huysmans MC, Frencken JE. Caries-preventive effect of sealants produced with altered glass-ionomer materials, after 2 years. Dent Mater 2012;28:554-60. Wuhan Statistics Department. Wuhan Year Book. Beijing: China Statistics Publishing House; 2007. WH.Gov. Available from: http://www.english.wh.gov.cn/publish/english/2012-04/20/1201204231744218195.html, 2012. [Last accessed on 2014 Sep 18]. Van′t Hof MA, Prahl-Andersen B, Kowalski CJ. A model for the study of developmental processes in dental research. J Dent Res 1976;55:359-66. Frencken JE, Pilot T, Songpaisan Y, Phantumvanit P. Atraumatic restorative treatment (ART): Rationale, technique, and development. J Public Health Dent 1996;56:135-40; discussion 161-3.